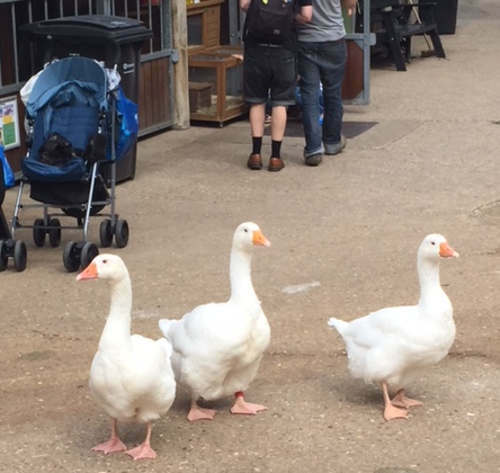 Kentish Town City Farm is a community charity that provides opportunities to help people connect with animals, nature and the environment. We are an educational resource for school children to learn about animal physiology, where food comes from and the natural world. We also provide therapeutic riding to people with special needs and farm related activities to local children and families. Members of the public, both individuals & groups, are also welcome to visit to see the animals and enjoy a quiet rural space. Children aged under 8 years old must be accompanied by an adult at all times while at the farm. The farm covers a 4.5 acre area alongside two railways lines. We have goats, sheep, ducks, chickens, geese, plus 3 horses, 2 donkeys, pigs and a cow, as well as community gardens and a wildlife pond. You might find the animals in their barns or pastures, depending on the time of day, season and weather. On your visit you are welcome to ask staff or volunteers questions about the farm & animals. KTCF is wheelchair accessible and seating areas offer visitors a chance to rest and enjoy the views. Accessible toilet facilities are available. Health & Safety notices are posted around the farm for your advice & guidance when near farm animals. Hand washing facilities are available on the yard. Visitor donations are also very welcome. You can pop a donation directly into our red post box on the farmyard. Your donation makes a difference, thank you. The Farm offers several options for organisations working with children. Booking is essential for all visiting schools & groups wishing to access these programmes. Call 020 7916 5421 or email info@ktcityfarm.org.uk to arrange your visit or make an inquiry. Outdoor Learning – see details of our very popular educational programme for schools. Tours of the Farm – available during the school holidays to visiting groups. Riding Opportunities – available for groups of children during holiday times. Health & Safety – Before bringing your group please go to Visit My Farm to download the updated 2015 Code of Practice – Essential Advice to Teachers and Others who organise visits for children. Please ensure your group organiser reads the advice to reduce potential risks when visiting farms.